Ye Have No Definition of Faith? Biologist and neo-atheist Richard Dawkins is brilliant when it comes to misrepresenting the Christian position. Dawkins many times presents the Christian worldview in a light that most likely is not even recognizable to the educated Christian. One such case with Mr. Dawkins is his complete and utter failure to understand the meaning of Biblical faith. Really? Perhaps if Mr. Dawkins were to actually investigate the matter, he would find that the Greek word for faith is pistis, which means "evidence" or "moral conviction." It is derived from the primary verb pietho, which means "to convince by argument" or "to assent to the evidence." 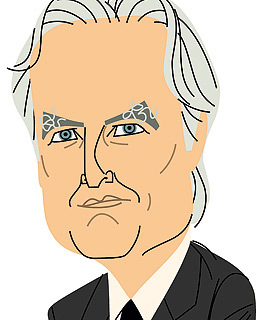 Richard Dawkins and his zeal for preaching his atheism is to be admired. However, his knowledge of the Bible and it's history is not. I believe that many times, we as Christians do not engage in the battle for ideas because we are simply afraid. We are afraid an objection will come up that we can't answer. We are afraid we will be made to look foolish. Or perhaps we are afraid that a challenge will be presented that calls into question what we believe and everything that we hold dear. As the Bible says, "For God hath not given us the spirit of fear; but of power, and of love, and of a sound mind" (2 Tim. 1:7, KJV, Emphasis mine). 1) J.I. Packer, quoted in Fundamentalism and the Word of God. Who Am I? You Sure You Wanna Know? As Spiderman: The Movie begins, we hear these now famous words from actor Tobey Maguire, who portrays Peter Parker aka The Amazing Spiderman. Mr. Parker goes on to tell us that the story of his life is not a happy little tale and that if someone told us otherwise, somebody lied. There are many times that the skeptic claims that he really wants to know the truth. He claims that he wants to know if there is a God, but says the evidence is simply unsatisfactory. Some will even say there is no evidence! I can't help but wonder if God sometimes is thinking, in moments such as these: "Who am I? You sure you wanna know?" "Could you please explain the article to us? You can't actually expect us to go and read the entire article." I quickly learned that what was being sought by these particular individuals was not scholarly evidence, but an intellectual sparing session. Please do not misunderstand me. There is a time and place for debate, however, when one claims to want evidence, but then will not take the time to consider it when provided, it's obvious that they are not seriously seeking answers. The Bible says, "And ye shall seek me, and find [me], when ye shall search for me with all your heart" (Jer. 29:13, KJV). Or, in other words, "Who am I? You sure you wanna know?" Does Richard Dawkins have a Selective Memory? First off, I want to start off this post by thanking everyone for their prayers and encouragement. We greatly appreciate it and ask that you continue to pray for us and this ministry. We are honored to be stewards of it for however long God allows! Second, here is a great article written by Rabbi Shmuley Boteach that originally appeared in The Jeruslalem Post, regarding a debate that Richard Dawkins participated in that he (Dawkins) claims never happened! This article also provides a great example of why believers need to get engaged in the debate that is continuing between theists and atheists, in a respectful manner. 1) Rabbi Shmuley Boteach, The Debate Richard Dawkins chose to Forget, http://www.shmuley.com/articles.php?id=627, April 13, 2008. * My thanks to Ben Witherington for drawing attention to this story on his blog. An additional article in regard to Boteach and Dawkins; a possible debate in the mix? For those who haven't heard, Oprah Winfrey has been preaching New Age doctrines for quite sometime. In the past, she has openly denied that Jesus Christ is the only way to God and endorsed such books as Rhonda Byrne's The Secret. Her latest book endorsement, A New Earth by Eckhart Tolle, has become a New Age sensation. Sadly, both Christians and non-Christians are flocking to their local bookstore to pick-up a copy. Here at Truthbomb Apologetics, it is our desire to provide followers of Christ with resources to engage those who are being deceived by the many false doctrines set forth in this book. In the next months, we will be providing resources via this blog for those with questions or for those who may know someone who may be deceived by Tolle and Oprah's false teachings. We will also be providing a review and discussing the main points of the book in our May (at the latest June) Newsletter. 1) http://www.christianity.ca/NetCommunity/Page.aspx?pid=5593&srcid=1520- Does Eckhart have It Right? by Jonathan Buck. 2) http://www.probe.org/cults-and-world-religions/oprahs-spirituality-exploring-a-new-earth.html- Steve Cable of Probe Ministries provides a sound critique here. This is possibly the best article on the topic I have found. 3) http://potandtorch.wordpress.com/2008/04/09/oprah-and-eckhart-tolles-new-religion/- You'll find a great critique of the above video here by a fellow blogger. 11) http://www.bpnews.net/BPFirstPerson.asp?ID=28150- Oprah and a Jealous God, written by pastor and professor of apologetics, Mark Coppenger, exposes Oprah's false understanding of a "jealous" God. First off, let me say that enjoyed your current book, What's So Great about Christianity, and your debates with both Christopher Hitchens and Daniel Dennett. I appreciate your willingness to stand on the side of theism and challenge the many unfounded arguments presented by the so-called New Atheist Camp. The purpose for writing you is to present a challenge. In reading your book and your current article, The Failure of Intelligent Design, I must say that I was and am surprised by the "hand wave" nature in which you simply brush-off the arguments put forth by those in the Intelligent Design(ID) Camp. Please do not misunderstand my intent. I am not insisting that you must believe that the world was created in 6 literal, 24 hour periods to be a Christian. I am, however, challenging you to provide some evidence for some of the blanket statements you have written in reference to the ID camp and to the theory of evolution. If you simply dismiss me as an ID'er or "bible-thumping" creationist, you only serve to prove my point. I don't care who is presenting the evidence for or against the positions, I want to examine the evidence itself. For example, in your latest article, The Failure of Intelligent Design, you make the bold comparison between Darwinian evolution and Einstein's theories of general and special relativity, implying that both are "supported by a wide body of data." However, as usual the case, we are not given any of the "data," but only assured its there. Isn't this the same type of argument that you would mock Mr. Hitchens for? Now, you may reply, "it seems improbable that the small group of intelligent design advocates is right and the entire community of biologists is wrong." Maybe so, however, I need evidence and a group of unnamed persons does not provide that. I could easily point out the growing list of scientists whom question the theory of evolution found at http://www.dissentfromdarwin.org/, but what will I have proved? Nothing. I have only served to prove that it is not universally accepted, however, the question still remains, "What is the evidence?" Simple put, I would encourage you to write your next book on the Intelligent Design vs. Evolution debate and actually critique and challenge the arguments from both camps. I believe that you will be challenged and surprised by what you find. From the statements made in your book and article, it's clear that you have only examined the debate at a surface level. If ID isn't science, tell us why. Why isn't the Cambrian Explosion better explained by a sudden creation? What about the holes in the fossil record you refer to? It's simply not enough to say, "Well, there may be problems, but since most folks believe it, so do I." Yikes! I'm glad that the 12 disciples didn't think that way! They didn't go by a majority vote, they went by what they KNEW to be true! To simply brush aside the credible arguments and objections put forth by the ID camp appears to be more of a political maneuver than a scholarly one. Perhaps following the example of former atheist Anthony Flew would do you well: "I just followed the evidence wherever it lead." 1) Dinesh D'Souza, The Failure of "Intelligent Design," http://www.townhall.com/Columnists/DineshDSouza/2008/04/07/the_failure_of_intelligent_design, April 7,2008. 2) Dinesh D'Souza, What's So Great about Christianity, p. 146. Be sure to checkout the messages preached by Faith Christian Fellowship's Senior Pastor, David Vance. Correction: The gentlemen I refer to in the sermon was not the valedictorian of my senior class, but the class president. I apologize for the error.